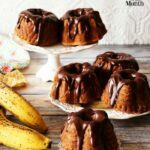 Gorgeous mini banana bundt cakes feature moist banana cake draped in smooth chocolate nutella ganache. 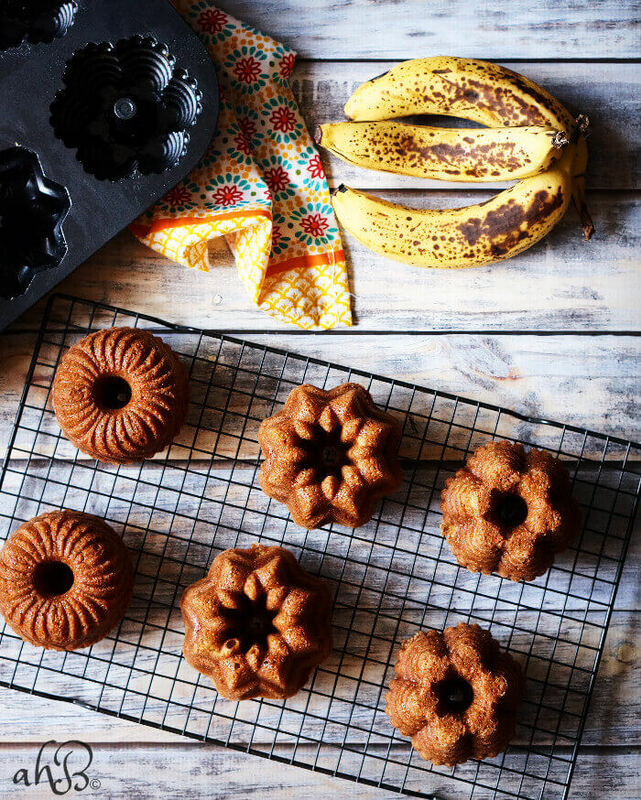 These banana bundts might be little, but there’s plenty here to love. Smooth and decadent chocolate nutella ganache. Check! A dessert that you can not feel guilty about eating for breakfast. Check! Here’s a two more reasons to convince you in case those weren’t enough. If you’re an empty nester, these gorgeous little cakes are portioned just right to share with your sweetheart, allowing you to freeze the extra cakes until they are needed so you’re not left figuring out what to do with the rest of a huge cake. If you’ve got kids at home, these little bundt cakes mean everyone can have their very own cake and that’s fun too. Who doesn’t like getting a cake all to themselves? Especially when it’s draped with chocolate nutella ganache. As far as bundt cakes go, we’re definitely living in the best time. There used to just be one option for baking bundt cakes–the basic bundt pan which is pretty but kind of boring. 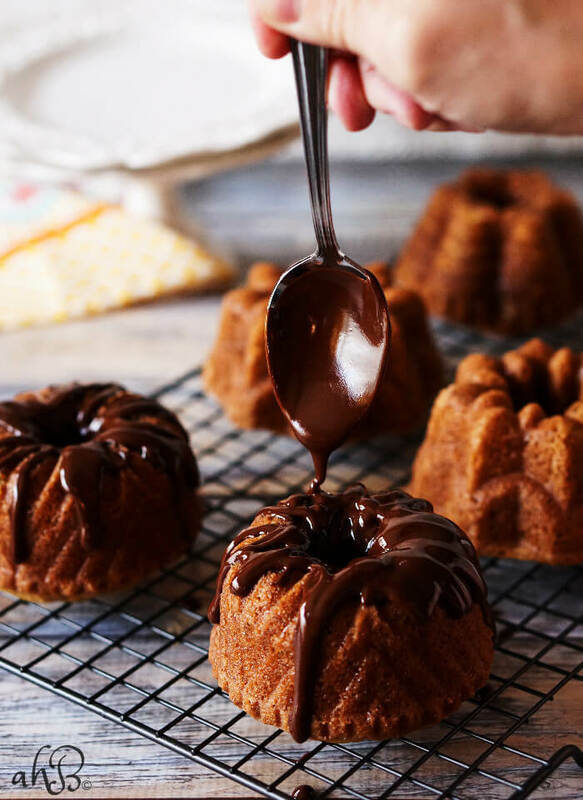 Now there’s a wide array of gorgeous and intricately shaped bundt cake pans. I personally love Nordic Ware bundt bakeware and have several different shaped cake pans hanging on my kitchen wall. Today’s banana mini bundt cakes were baked in this 6 cup capacity mini bundt pan. 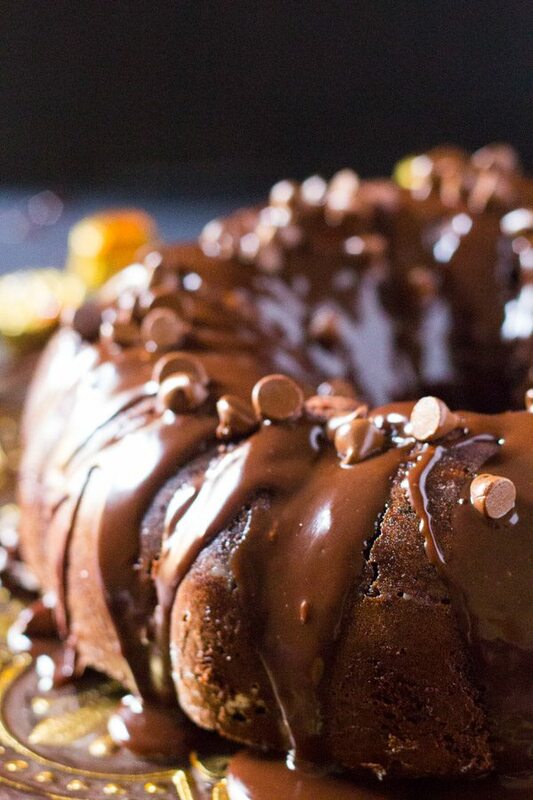 The thing that I love about bundts, a great bundt pan will make a wow cake with minimal work. Speaking of minimal work, when it’s time to turn out your cake it should be minimal work. Your cake should just slide right out. I know that this isn’t always the case. Many a time I’ve gone to turn out a bundt cake and had only half the cake come out and the rest stick to the top of the pan. It’s the WORST! The best thing I’ve found to stop this from happening is to make my own homemade cake release (like Baker’s Joy). This stuff is easy to make and it works. Try it with any cake you bake and be wowed! 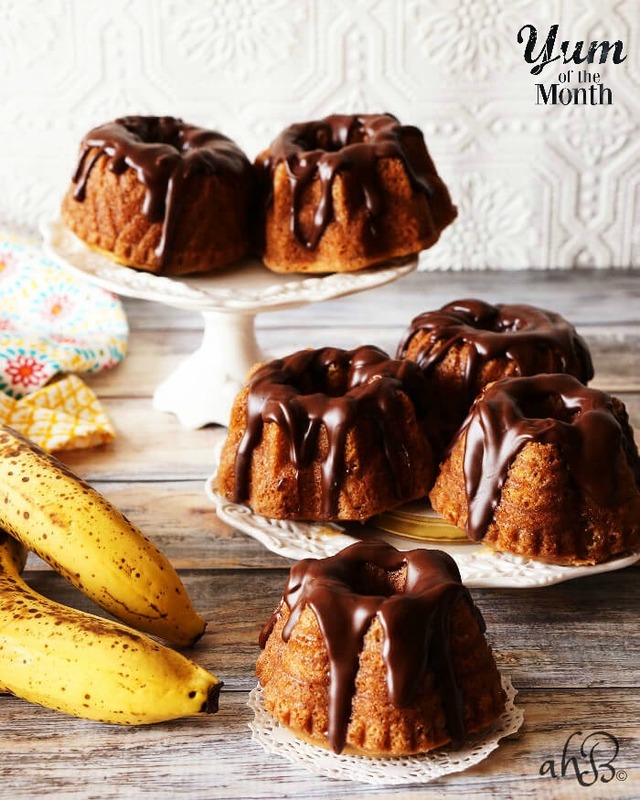 Gorgeous mini banana bundt cakes feature moist banana cake draped in smooth chocolate nutella ganache. Preheat the oven to 325 degrees. Prepare a 6 cup capacity mini bundt pan with either Baker's Joy spray or homemade cake release. In a small mixing bowl, combine the flour, baking soda, and salt. In a medium mixing bowl, beat the butter until light and creamy, add the sugar and beat again until fluffy. Add the egg, vanilla, and bananas mixing until well combined. Add half the dry ingredients and the sour cream, mixing on low and finishing with the remaining dry ingredients. Pour the cake batter into the prepared mini bundt pan, filling each cavity 2/3 full. 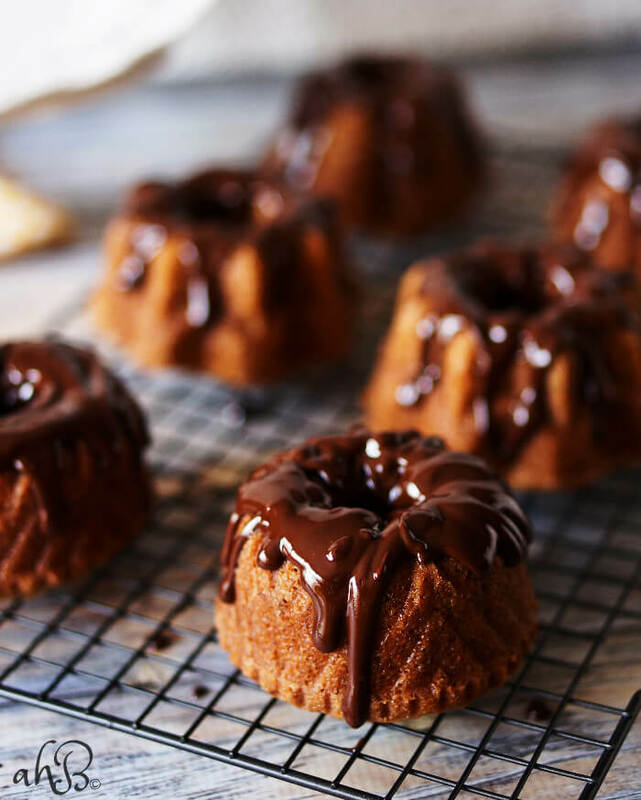 Lightly tap the bundt pan on the counter to remove any large air bubbles. Bake at 325 degrees for 30 minutes or until the cakes are golden brown and a toothpick inserted in the center comes out clean. Cool on a wire rack for 10 minutes and then turn out the cakes. Cool completely. Over low heat, melt the chocolate chips and butter together until completely melted and no lumps remain. Whisk in the Nutella and drizzle over the cakes. 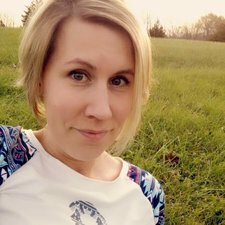 This month we are welcoming Marsha of Marsha’s Baking Addiction to the YOTM group. 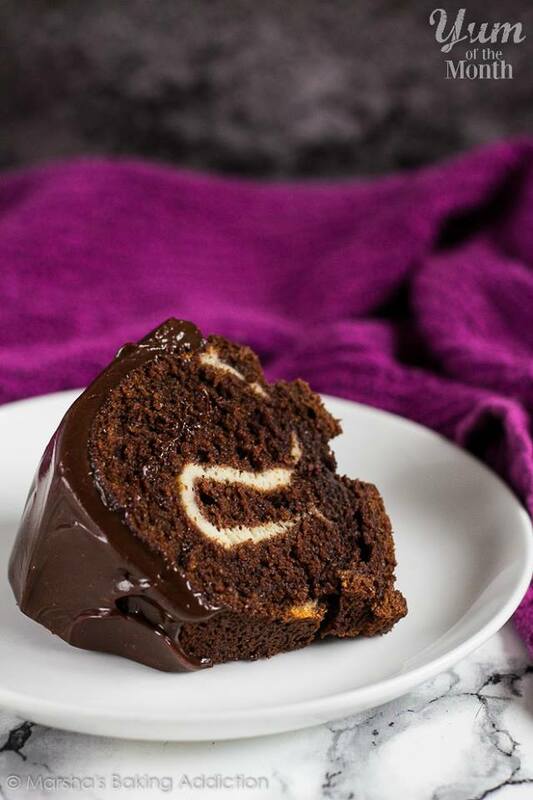 Marsha chose our theme of bundt cakes this month and contributed this Cheesecake Swirl Chocolate Bundt Cake. Wajeeha from I Knead to Eat also went with a chocolate bundt cake, but hers is a Reeses Triple Chocolate Bundt Cake. 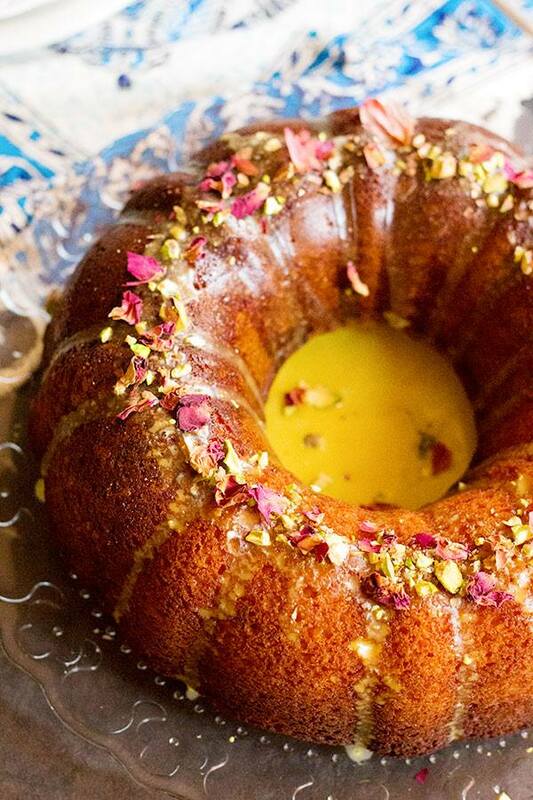 This Persian Love Bundt Cake from Shadi at Unicorns in the Kitchen is filled with aromatic rosewater and cardamom. 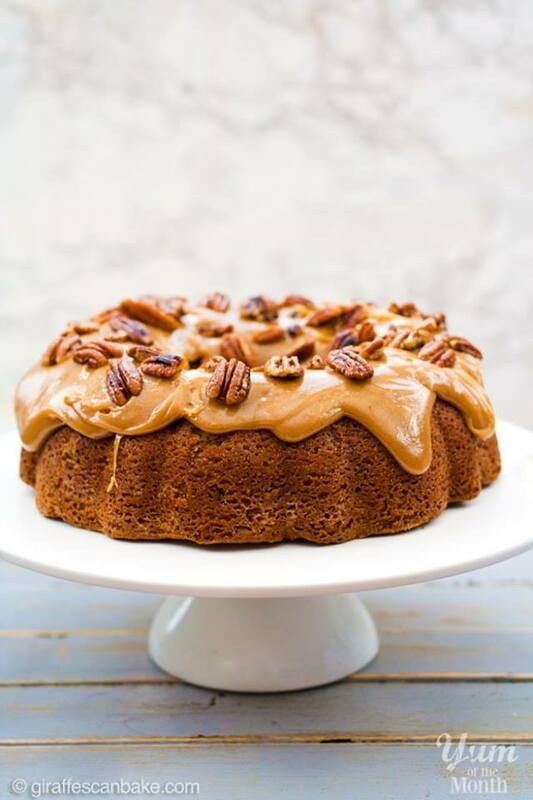 And for a gluten free option, Michelle at Giraffes Can Bake has for us this Brown Sugar and Pecan Caramel Bundt Cake. I’m loving these mini bundt cakes! Nutella and banana are my favorite combination in desserts, and these look like just the perfect dessert or snack! These little bundts are soooo cute! They look totally delicious too, love that banana and Nutella combo! These cakes look so adorable and delicious! I’m loving that Nutella glaze! Thanks Marsha. I’m a total Nutella fiend! Between my daughter and I we go through that stuff like crazy.